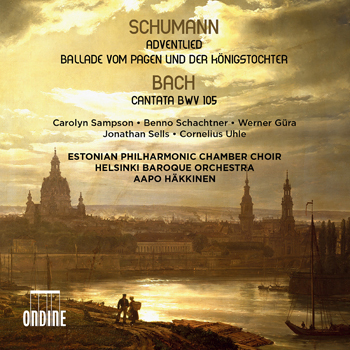 Helsinki Baroque Orchestra and the Estonian Philharmonic Chamber Choir led by Aapo Häkkinen join their forces together with an impressive vocal cast, Carolyn Sampson, Benno Schachtner, Werner Güra, Jonathan Sells and Cornelius Uhle, in this unique release of rarely heard choral works by Robert Schumann (1810-1856). Estonian Philharmonic Chamber Choir (EPCC) is one of the best-known Estonian music groups in the world. The repertoire of the choir extends from baroque to contemporary music, focusing on the work of Estonian composers. EPCC has cooperated with many outstanding conductors and orchestras, and has been a welcome guest at numerous music festivals and venues all over the world, including the BBC Proms and the Lincoln Center in New York, among others. The choir’s recordings have won several awards. For twenty years, Helsinki Baroque Orchestra’s performances and recordings have been captivating audiences with a potent combination of emotional eloquence and infectious vitality. Their programmes frequently include first modern performances of unpublished or reconstructed masterpieces, and also shed unexpected and often provocative new light on more familiar works. Their music-making has contributed to the ensemble’s reputation as a major exponent of Baltic and German Baroque music. Helsinki Baroque’s sound has enthralled listeners from the Cologne Philharmonie to Tokyo’s Suntory Hall and the Amsterdam Concertgebouw, and at major festivals such as Bergen, Bremen, Rheingau, and Jerusalem. Aapo Häkkinen is known as a distinguished chamber musician and director. Häkkinen has collaborated with several well-known artists around the world and programmed opera performances. Besides the harpsichord, he regularly performs on the organ, on the clavichord, and on the fortepiano. He has commissioned, given premières, and recorded music by various composers. He teaches at the Sibelius Academy and at international masterclasses (Tokyo University of Arts, Universidad Nacional de México, Kulturstiftung Marienmünster, Bratislava, Sofia, Tallinn, Tampere, Turku, Zagreb Academies of Music). He is Artistic Director of the Helsinki Baroque Orchestra and of the Helsinki Musiikkitalo Early Music Series as well as the Janakkala Baroque Festival.